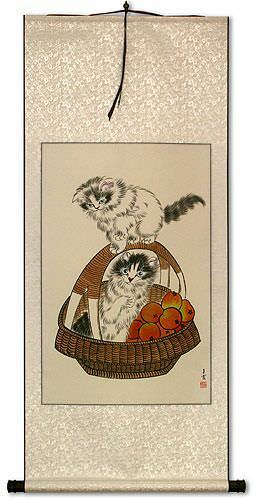 Artwork Panel: 45cm x 69cm ≈ 17¾" x 27¼"
Silk/Brocade: 54.2cm x 124.3cm ≈ 21¼" x 49"
Width at Wooden Knobs: 63.2cm ≈ 24¾"
This artwork features two curious kittens in a basket. 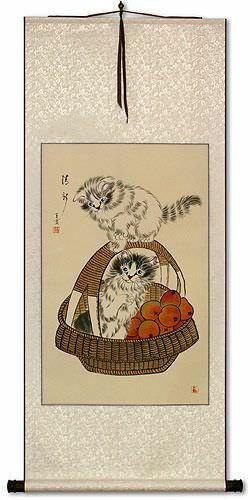 This cute Chinese kittens wall scroll is titled "Fresh and New" or simply "Freshness". 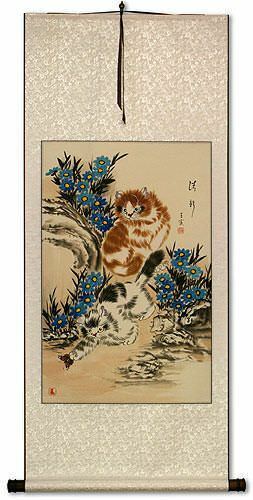 This is one of a handful of kittens and butterfly paintings that I picked up on a trip to Jinan, in Shandong Province (about five hours by train from my home in Beijing). After several taxi rides to the wrong place, I find an underground art market in Jinan, full of artists' galleries and studios. There are probably 100 artists in the place, many of them busy at work, painting and creating. I look at all of their work, and spend several days looking through many paintings. As I take my time walking around, these paintings really catch my eye. They are higher quality that most and the attention to detail is excellent. I look through all of them and buy what I feel are the best of the bunch. 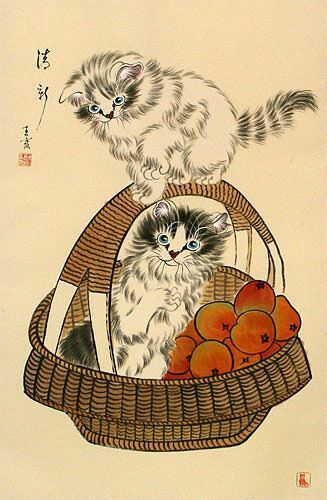 I also know that this style will be very popular, and perhaps I will finally please the dozens of women who have emailed me looking for cats or kittens done in traditional watercolor. 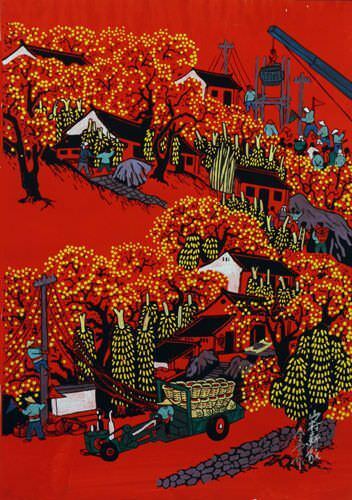 The artist's name is (Wang Xia). She learned to paint from her uncle at a very young age. 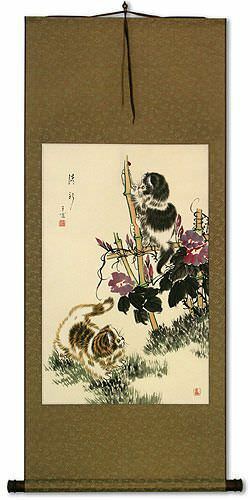 She perfected her traditional Chinese painting techniques after several years of study and practice. But she felt a calling to do more contemporary art. Torn between the two styles, she combined traditional techniques with contemporary themes. Through the years, she has received several awards at national art competitions in China. 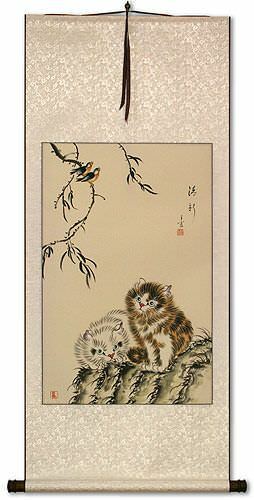 One of her "Cats and Butterflies" paintings received an award for excellence at the 1995 International Competition for Arts held in Tokyo, Japan. 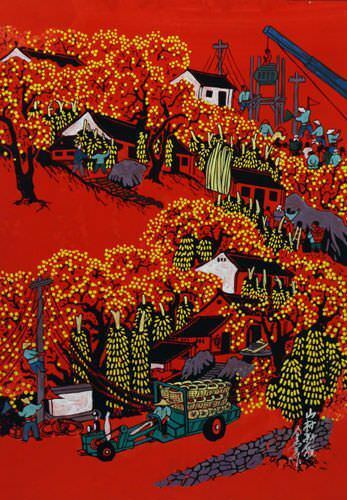 Her works were also collected and put on display at the "Famous Artists Exhibition" in honor of the 45th anniversary of the People's Republic of China. This painting has a lot of detail, from whiskers, to the fur. All is done in a time-consuming effort with a very fine brush. It is not a style of painting that can be done quickly, and rather takes several hours to complete one painting.